"The work of composer and ethnomusicologist Ernö Kiràly can be described as simple, radical & surrealist including raw modernity, archaic and avant-garde approach. His creative method has more in common with the American avant-garde (improvisation, instrument building, composer-performer, multi-instrumentalism) than with dogmatically rigid European compositional practice. The decisive factor in his career was ethnomusicology, which he began in the fifties, collecting the vocal and instrumental music of the people of the Voïvodine region (Hungarian, Serbs, Croats, Slovaks, gypsies) as well as their folk instruments: zithers, drums, flutes and fifes. 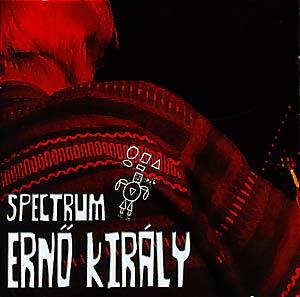 The work entitled Spectrum which appears on this album is a hitherto unissued representative selection of Kiràly's work. Included is an opera for children based on a folk tale recorded in 1963, early 70's recordings of his works on citraphone, tablophone, accoustic guitar and zither, Katlin Ladlik visual poetry, and composed music played by Ensemble Acezantez. A 1998 'home-recorded' solo improvisation on Tablophone is also included as a bonus. Autobus is the label of French band Dragibus. The label is dedicated to adventurous music for children and kidults."